Ok, so living in Florida doesn’t exactly provide the extreme seasonal weather changes that our Northbound friends get to experience, but we make up for it by going all out in regards to fall and winter decor, food, drink and parties. We enjoy hot cocoa, bonfires and a good, hot bowl of comforting soup as much as our cold-weather comrades do. It’s just that we enjoy our soup on our lanais (that’s Florida-speak for screened porch), rather than in front of a roaring fireplace. One of my favorite cold-weather soups when I was growing up was a big bowl of creamy, chunky New England clam chowder. Don’t even try to pass off the broth-based stuff to me when I’m craving the white kind. It won’t fly. Now that I’m a little older (and somewhat wiser), canned or packaged foods won’t fly, either. If I’m going to indulge, it’s got to be the real deal. That’s why I decided to endeavor to concoct a satisfying pot of homemade clam chowder. Guess what? It. Was. Awesome. My plan was to make it and freeze it for later consumption – it didn’t happen that way. 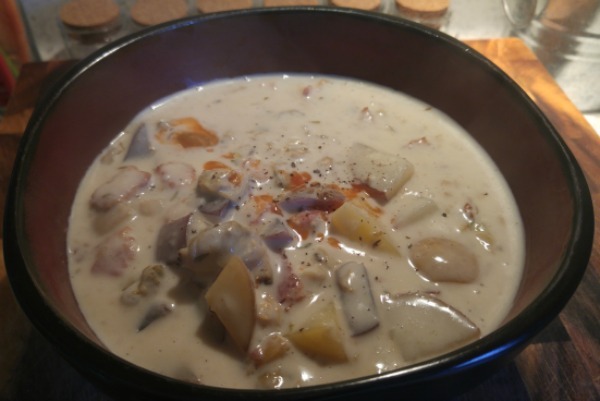 I made the chowder, tasted it, offered a taste to Alex (because there is never anything wrong with getting a second, unbiased opinion), and that’s where the plan fell apart. It was so delicious that we ate the majority of the pot right then and there. Note to self: next time, make a double batch. Drain the clams and save the liquid. Heat the olive oil in your soup pot and cook the bacon until it is pretty crispy, and then add the onions. 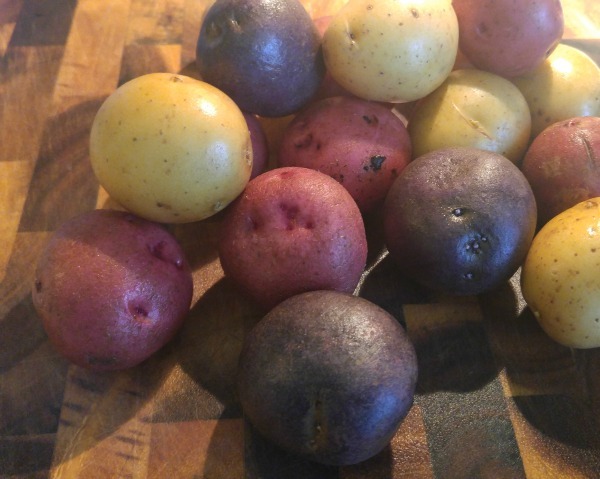 When the onions are soft and translucent, add the potatoes and a little bit of the clam juice – just enough so that the potatoes don’t stick to the pot. 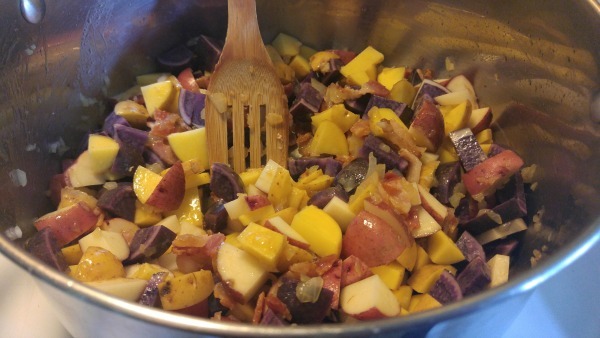 Cook the potatoes for 5 – 7 minutes and then sprinkle the flour over the whole thing. 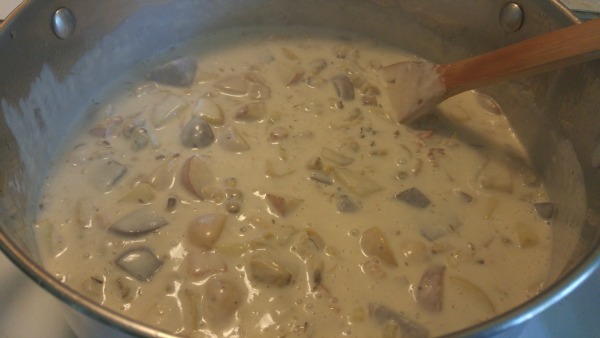 Stir in the remaining clam juice, making sure everything is mixed in well and there are no flour lumps. Add the half-and-half and stir together; add the thyme, bay leaves, salt and pepper and cover. Let simmer for 10 – 15 minutes, stirring occasionally. Stir in the clams, and pull out the bay leaves and discard. Serve bowls of chowder with a couple of shakes of hot sauce and a sprinkle of black pepper. 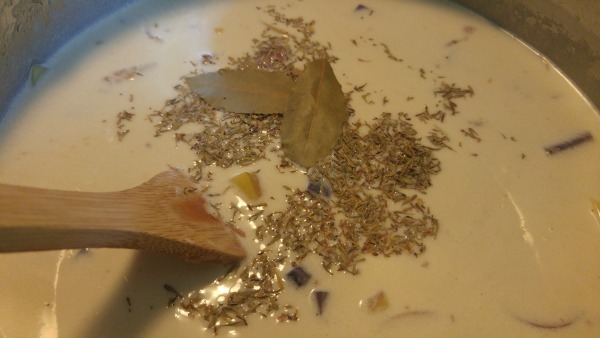 *This recipe was adapted from the fabulous Anne Burrell’s chowder recipe.